Our Products >> .500-.465 N.E. by Kynoch, FMJ, Newer H/S, 1 Cartridge not a Box! 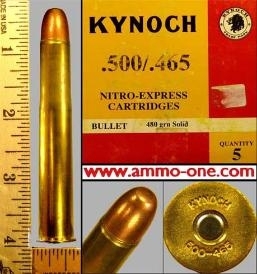 One Cartridge, not a Box: 500-465 Nitro Express by Kynoch of England, clean & bright, factory loaded with new Kynoch brass cases with “KYNOCH 500-465” Head-Stamp, small nickel primer and loaded with a 480 grain, copper coated steel covered, FMJ (Full Metal Jacketed) projectile. .500-.465 N.E. by Kynoch, FMJ, Newer H/S, 1 Cartridge not a Box!